The awesome new trailer for Tim Burton’s upcoming adaptation of Miss Peregrine’s Home for Peculiar Children has just been released. 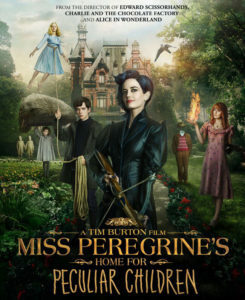 As previously reported, Miss Peregrine’s Home for Peculiar Children revolves around the adventures of 16-year-old Jacob Portman (played by Asa Butterfield), who somehow finds himself on a mysterious island full of peculiar orphans who are under the protection of the magical Miss Peregrine (played by Eva Green), a shape-shifter called an ymbryne. According to an article by EW, the peculiar children are under threat from monsters called hollows (one of whom is played by Samuel L. Jackson), who have been hunting them for their powers for centuries. Miss Peregrine protects them by keeping them inside a time loop: “a loop preserves the last 24 hours. Reset the loop and you can stay here forever,” she explains in the trailer. The film is based on the 2011 novel of the same name by Ransom Riggs. The children all possess unique and possibly terrifying abilities (called peculiarities) that set them apart from everyone else. One girl can fly but has to be tethered to the ground to prevent her from floating away. Another has a mouth at the back of her head, while one can manipulate plants. There’s also an invisible boy and a pair of masked twins. The dark fantasy and horror elements of the story fit well with Tim Burton’s style, and the film looks like it will be as charming and intriguing as his other works. Miss Peregrine’s Home for Peculiar Children also stars Ella Purnell, Lauren McCrostie, Milo Parker, Cameron King, Pixie Davies, Georgia Pemberton, Finlay MacMillan, Milo Parker, Raffiella Chapman, Hayden Keeler-Stone, and Louis Davison as the peculiar children. Some of the adults will be played by Chris O’Dowd, Allison Janey, Terence Stamp, Judi Dench, Rupert Everett, and Kim Dickens. Miss Peregrine’s Home for Peculiar Children opens on September 30, 2016.